What happens if something occurs that is not covered in the rule book? The players in the game should try to decide the issue and carry on. If that is impossible, the striker shall rule and thereby set a precedent until the USCA is contacted for an official ruling. Is there any particular way that I must hold the mallet and hit the ball? No, except that you cannot “push” the balls, i.e., you keep swinging so that your mallet is really pushing the ball forward. However, it is advisable to use a traditional swing, where you swing the mallet in a straight line between your legs, as opposed to from the side like golf. Can I really use my hand or foot to hold my ball while hitting it and knocking another ball away? Yes, if you have hit that other ball and have scored bonus shots. You may place your ball right next to that other ball and do so. This is called either a “hand roquet” or a “foot roquet.” If the striker ball comes loose from the foot or hand after hitting it there is no penalty and you can simply play the striker ball from where it comes to rest. What happens if I miss my ball entirely on a shot? It counts as a shot, and if you had only one shot when you missed, your turn ends. What happens when someone plays out of turn? Is there a penalty? No, but once the out-of-turn play is discovered, you must replace the ball that last played out of turn and have the correct ball play. (See the out of turn rule in the main section for an example). Is there a rule that says you are ‘dead’ on a ball you’ve hit (not allowed to hit it) until you make your next wicket? Yes, see Option 1. 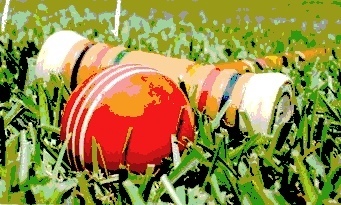 In the regular version of backyard croquet, however, there is no carryover of “deadness” from one turn to the next (unless using Option 1) and no penalty or reward for hitting a ball more than once between wickets. Once you hit a ball and earn the two extra shots for the roquet, you cannot earn any extra shots for hitting it again until you either a) make your next wicket or b) finish your turn. Playing with carryover deadness is optional in nine-wicket croquet but is very much a part of the American six-wicket game played in clubs and tournaments. The tournament rules available from the USCA cover the details of this and other aspects of advanced play. At what point can I start hitting other balls and earning bonus shots? Once the first ball has finished its first turn. That means after blue has finished its first turn, red and the remaining balls can strike it and start earning bonus shots immediately (unless Option 3 is used). What happens if I hit a ball that I’m dead on? When Option 1 is in effect, all balls are replaced and the turn is over. If Option 1 is not being used, there is no penalty for hitting a dead ball; however you don’t get two shots for that hit. What if I strike my mallet into another ball accidentally? The shot must be replayed correctly with no loss of turn. When you send another ball away by a foot shot or hand shot, do you lose your second bonus stroke if your ball also moves after hitting it? No, you just play your ball from where it comes to rest. If my ball is right up against a wicket or the turning stake, can I just hit the back of the stake or wicket and hope that knocks my ball forward? No. Your mallet head must strike the ball. If I have a mallet head that is round, and my ball is up against the turning stake, can I just run my mallet head downward between the stake and the ball in order to move the ball as my shot? Can I keep playing after my ball passes through all the wickets and hits the finishing stake? No. Once either you or an opponent causes your ball to hit the finishing stake (after you have made all the wickets), you must remove your ball from the court and your ball may not be played anymore. If you do not hit the finishing stake, you may continue playing, either as a rover or as poison, depending on which rules are used in the game. Do I have to go through the wickets in any particular order? If my ball hits another ball and then goes through its next wicket, what happens next? If your ball hits another ball, you immediately earn two extra shots (unless you have hit that ball in that turn since making your last wicket). In this situation, the wicket doesn’t count, and you must take the extra shots earned. If my ball goes through a wicket and then hits another ball on the same shot, what happens next? In this case, you have earned one extra shot for the wicket, but the roquet on the other ball is ignored. You may choose to hit that ball again on the continuation shot to earn two extra shots, but you aren’t required to do so. Don’t I get 3 bonus shots if my ball hits another ball and goes through a wicket on the same shot? No. Bonus shots are not accumulated. One shot either results in one more bonus shot or two, depending on the shot. One shot can never result in 3 bonus shots. What happens when, after receiving two bonus shots, my first bonus shot clears a wicket? Do I still have 2 bonus shots or just 1? You have one shot left, in that you lose your second bonus shot from the prior roquet, but you still have one stroke left for scoring the wicket. If my ball is hit through a wicket by an opponent, do I get credit for scoring that wicket? Yes. You get credit for that wicket and you can move on to the next wicket. When it is your turn to shoot next, you still have only one shot from where your ball ended up. When is a ball through a wicket? See the Basic Rules, Diagram 3, and discussion in the “Scoring Wicket and Stake Points” section above. If I send a ball over the boundary, is there a penalty? No (unless you use Option 2), sending a ball out of bounds does not end your turn. When a ball goes out of bounds, it is replaced a mallet length (or, on a small court, a mallet-head) in from the boundary, and if the striker has another shot, the turn continues. When placing your ball back in bounds, do you have to place it the length of the mallet or can you use the length of the mallet head? The default rule is to use one mallet length. If you play by Option 3, one mallet head length or 9 inches is used instead. One reason Option 3 is invoked is if the court is short grass or small and using a full mallet length would be too much. When you go out of bounds, do you have to place your ball back in bounds immediately or can you wait until your turn? You must immediately place your ball back in bounds. When placing your ball back in bounds, do you have to place it 90 degrees inbounds to the line at the point it went out or at any angle at the point it went out? The ball must be placed perpendicular and not at a diagonal angle from where it went out of bounds. The striker may measure any ball in bounds first and then place the other(s) a mallet-head length away from it on either side. May I choose not to use a boundary? In informal play, yes. In USCA sanctioned tournament play, no. Is there a variation of croquet called ‘Poison’? Can I create my own rules and variations for croquet? Yes, this is done all the time; however, it is the purpose of the USCA to standardize one set of rules. If a variation is to be used, it should be announced before the start of a game. At the start of the game, is it better to go first or last? Generally, it’s better to go last, because the more balls in front of you, the more options you have in playing your ball. So, unlike other games, it is not polite to insist that the other team/player goes first. If I roquet a ball and pick up my ball (ball in hand), can I put it back down in its original position to take my first bonus shot? Yes. If Challenging Option 9 is in effect, then the answer is No. You must use way 1, 2 or 3 once you pick up the striker ball after a roquet for taking the first bonus shot.